So I think I have picked a place for the trip. Just need to get the hubby completely on board but Barbados is where I am hoping. Do you know sold me on Barbados, swimming with turtles! I love turtles. I am not sure why but they are just so cute and curious. When we went away last year I never for a chance to see them so this year, I have to! Now that I don't have to spend my time searching out my vacation spots I can bake and blog. I could have gotten this post out last night but I decided to spend my night curled up in a blanket, watching tv half asleep on the couch. I was walking through the grocery store the other day in my usual search for new products and saw Gluten Free Brown Rice Krispies. I haven't made some rice krispie squares in quite some time and since they are always such an easy fun treat I couldn't resist. Easy, delicious and easy to transform. 1) Melt butter and marshmallows in a large sauce pan on medium-low Continue until marshmallows are almost completely melted. 3) Add the chopped mars bars, occasionally stirring to combine. 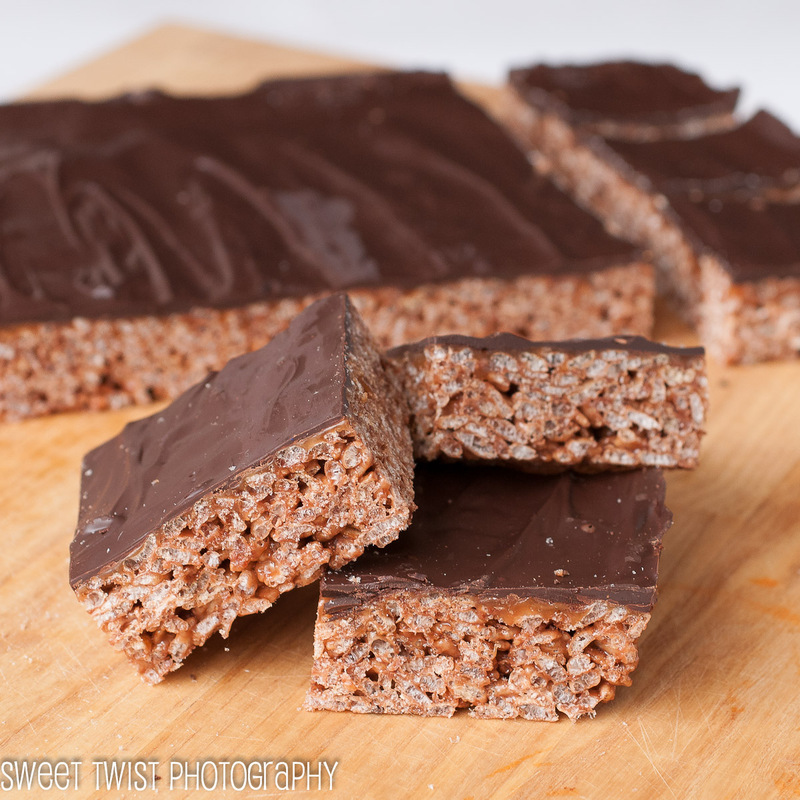 4) Once chocolate is melted, remove from heat and add rice krispies. Stir to combine and coat all krispies. 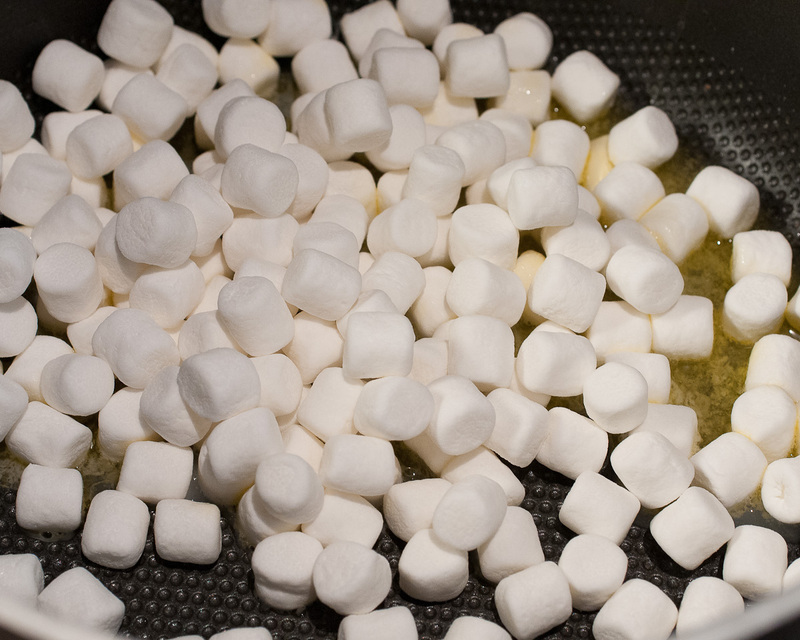 5) Press into a 9 inch square pan, dampening your hands lightly with water if too sticky. 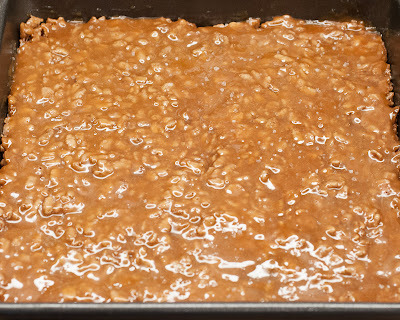 6) Make the caramel : add sugar and water to a small sauce pan. Heat on medium-high heat. Mixture will begin to boil and darken. 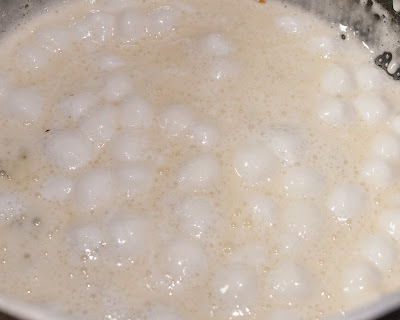 Brush the sides of the pan with water to prevent crystallizing. Gently swirl in pan as it begins to darken. 7) When is starts to become a medium caramel colour, add the cream. Stirring with a spatula to combine. 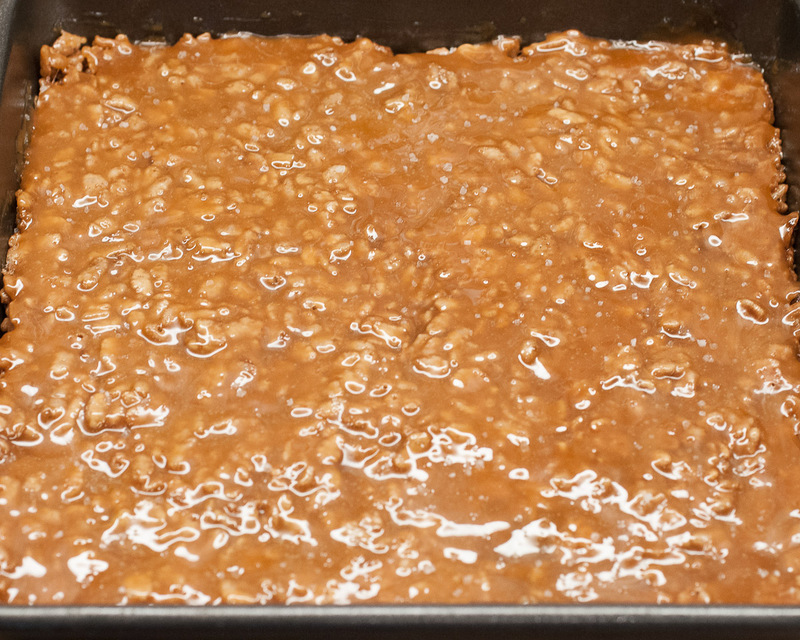 8) Pour the caramel sauce over the rice krispies, using mini spatula to spread evenly, working quickly. Sprinkle the caramel with sea salt. 9) Melt the dark chocolate using a double boiler and pour the melted chocolate over the caramel. Also using a mini spatula to spread evenly. 10) Place in fridge to cool and set up. Slice into squares and serve. I may double the caramel layer in the future as I think it was pretty thin. 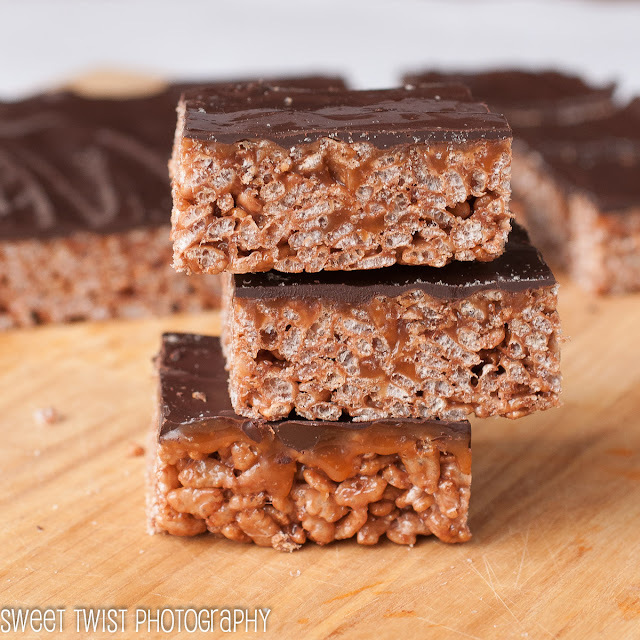 Even with the thin layer every now and then you would get a bite that had a little hint of the salt with the caramel and the crunchiness and sweetness of the rice krispie. It was heaven! I haven't done too much with salted caramel but I fear an obsession coming on. These are so creative and sound fantastic! I don't think I've seen brown rice Rice Krispies but I'll have to take a look next time I go to grocery shopping. 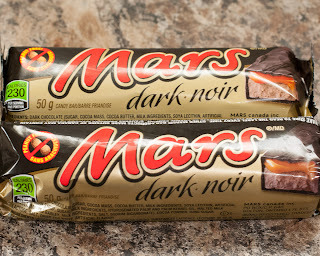 Can you bring me some of these on Monday?